New students from the IPB University (IPB) are getting easier to get the best service through SIMARA. Namely the Dormitory Management Information System. SIMARA is an android application that can be downloaded on Google Play by using an Android-based handphone. In this SIMARA, users, especially students of the General Competency Education Program (PPKU), can easily send complaints on facilities and infrastructure in the Dormitory Building and Common Class Room (CCR) such as general complaints, water, electricity and other complaints. In addition, students can also submit active lecture certificates, sick information, free detention of Student Identity Cards (KTM) and others. 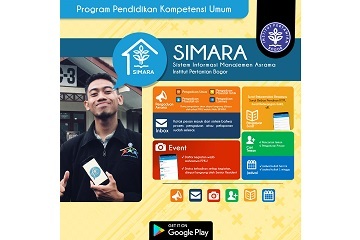 SIMARA is an application by Heni Taryani, an Outstanding Education Personnel of IPB University who won first place as the best Financial Management Unit (PKU) at the National level. "The purpose of the SIMARA application is to facilitate all academic and non-academic administrative processes. I am only a drafter. Furthermore, from the input from the leadership, the concept was developed which initially only for reporting the facilities and infrastructure of the Dormitory increased to correspondence administration, PPAMB activities and information about packages. For the manufacture of the system, PPKU requested the assistance of system creation services from PT. Sintaxindo. While to be uploaded through the IPB University apps, Alhamdulillah PPKU was facilitated and assisted by leaders and colleagues from the Directorate of Information Systems and Digital Transformation (DSITD). "He said. Meanwhile, Prof. Toni Bakhtiar, as Director of PPKU IPB University revealed that all PPKU students could use SIMARA as a means to convey their aspirations, both about facilities and infrastructure, and related to student administration.